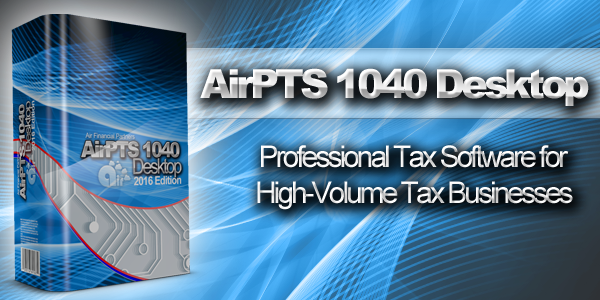 AirPTS 1040 Desktop is backed by the industry's leading desktop professional tax software solution for high-volume tax businesses. Built based on the needs of busy tax offices that specialize in providing their taxpayer clients with fast and accurate tax returns, AirPTS 1040 Desktop has been a trusted software solution since 2016. With industry-leading tools such as Point-and-Shoot Error Correction™, exclusive TextLink™ integrated text messaging technology, and support for electronic signature pads and hand-held W-2 barcode scanners, AirPTS 1040 Desktop software users are able to process tax returns more quickly and accurately. AirPTS 1040 Desktop built-in depreciation module manages complex depreciation calculations and transfers depreciation and asset sales information to the tax forms automatically. AirPTS 1040 is the fastest, easiest, and most efficient professional tax software solution for high-volume tax businesses that specialize in offering quick & accurate tax refunds and bank products. Built to speed processing of your clients’ tax returns and bank product refunds, AirPTS 1040 professional tax software helps you stay a step ahead of your competition. Work-in-Progress Screen for instant status of tax returns, IRS acknowledgements, rejects and bank product check prints. AirPTS 1040 has been built with a host of industry-leading tools and features designed for high-volume professional tax preparation businesses specializing in bank products. AirPTS Business tax software offers a complete solution for professional tax preparers who prepare Federal and State business tax returns.